Scarsdale, NY dental practice gains another prosthodontic expert with the addition of Dr. Farrell to the group. Advanced Dentistry of Scarsdale, a comprehensive aesthetic and reconstructive dental group, is proud to announce the addition of Dr. Kimberly A. Farrell to their team of dental professionals. Dr. Farrell attended Wagner College in Staten Island to achieve her BS in Chemistry, received her DMD from the University of Pennsylvania School of Dental Medicine and followed with a residency at New York Methodist Hospital in Brooklyn. She completed her post graduate work at the University of Connecticut where she received her certificate in Prosthodontics, her MDS and is currently a board certified prosthodontist. 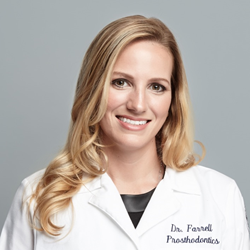 Dr. Farrell joins a highly qualified team at Advanced Dentistry of Scarsdale; the existing clinicians include two other Prosthodontists, a Periodontist (specializing Implants, gum disease and treatment) and a cross-trained Periodontist / Orthodontist. The practice boasts its own on-site dental ceramics laboratory, a warm, friendly environment, and a range of services that ensure most patients can receive all their dental care under one roof. To schedule a consultation or appointment, visit the practice website or call (914) 725-7100.